the initial release of reaktivate. July 9, 2001 (The INTERNET). to Konqueror, and it was possible. Reaktivate can eventually be used to embed any ActiveX control into Konqueror. Currently, however, not all ActiveX controls are compatible with reaktivate. will not yet work with reaktivate. Microsoft's ActiveX technology has often been criticized for weak security. access to WINE's registry and all files visible to the WINE installation. 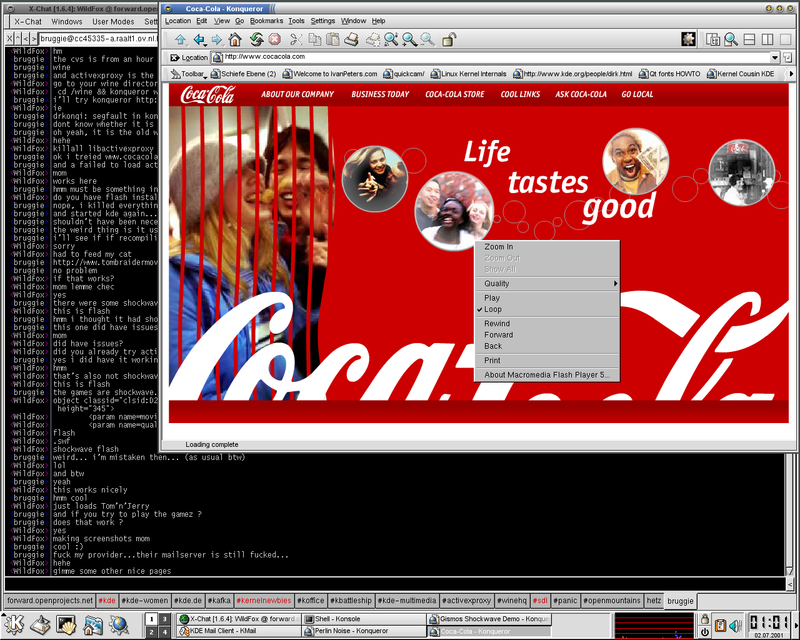 KDE, K Desktop Environment and Konqueror are trademarks of KDE e.V. are registered trademarks or trademarks of Microsoft Corporation. the United States and/or other countries. I see, so you did not buy the official Mandrake? Or else what is this "basic" Mandrake that you talk about? I only see the Standard Edition and Deluxe Edition here in Montreal stores. Perhaps in your country it is different. Anyway, I think I already said everything that I wanted, and more, in this conversation, I'm out. Of course it is the download version and also the magazines version. (and be quite, I bought a standard edition before you and -perhaps - before anybody else, the first day of the avalaibility of Mandrake 5.6, in Paris). You misunderstand. Navindra wants Konqueror's Flash and Java to work too, but she is telling you that it is not *KDE's* fault that *Mandrake's* distribution doesn't install Java and Flash by default. If you want Konqueror to have Java and Flash working in Mandrake, you must talk to Mandrake. There is unfortunately nothing KDE can do about it, because Flash and Java are not KDE programs and can't be included with the KDE packages (legal difficulties). This discussion should be taking place at Mandrakeforum.com, where you would be able to talk to other Mandrake users about this Mandrake-specific problem. > There is unfortunately nothing KDE can do about it, because Flash and Java are not KDE programs and can't be included with the KDE packages (legal difficulties). I don't say that Flash and Java are to be included in KDE packages, I know there are legal difficulties. I said that the Konqueror team may write some scripts so that any distribution and any advanced user may easily (and in the same way) add Flash and Java to Konqueror so that it will be very simple and transparent (nothing to do) for the end users of distribs. And I add now that it is perhaps possible that the Konqueror team create a separate package according to legal things so that it installs all the plugins of Konqueror. So if a distrib is only GPLed, the user has only to download and install a rpm (or something like). I think it is the problem of KDE, yes. Hi! Have just installed Mandrake 8.2. Im a newbie in this. Got the same problem. Maybe it is a good idea to include at least some kind of popup to give nwebies easy way to install Java and Flash. Ohhhhh!!!!... 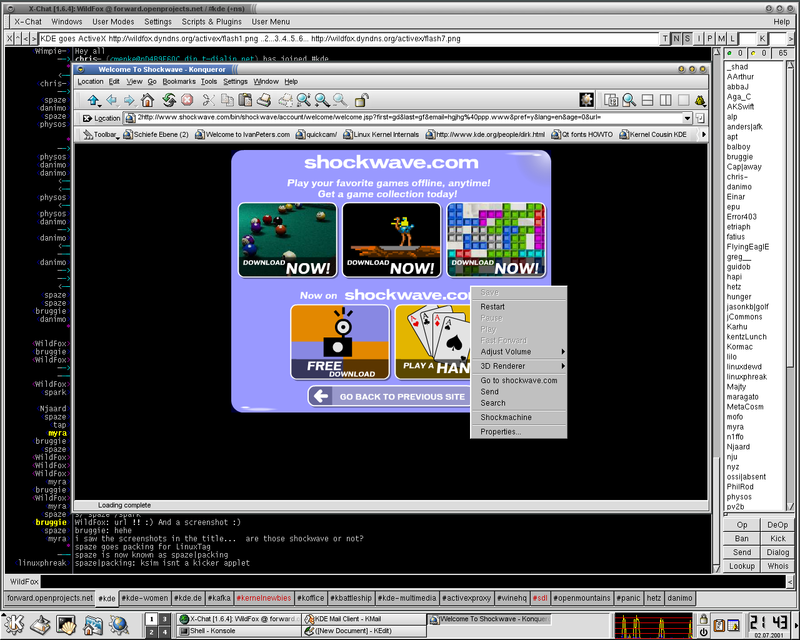 My new Mandrake 9.0 (update at this date dic-2002) does not work correctly: java and flash are not implement in this distribution in any browsers. I think Mandrake is making BIG mistakes to the newbie Linux users. Install Netscape. This will solve all the probblems. Allow me to rant for a moment. Whenever I do a search for any sort of help with Linux, all I find is a bunch of whining about how hard Linux is. If all you want to do is complain, reformat your hard drive and pony up some cash to Bill Gates. He'll be glad to sell you the latest incarnation of Windows! I'm the type of person who drives a manual shift transmission in my car because it gives me a certain measure of control - within certain parameters, of course. I'm trying out Linux because I believe that, despite its sharper learning curve, the end result will be ultimatly more satisfying. b: remember to pick up some baby food the next time you go grocery shopping. You obviously need it! After re-reading, I meant to say Java and Flash. No need to install Java twice, now is there? 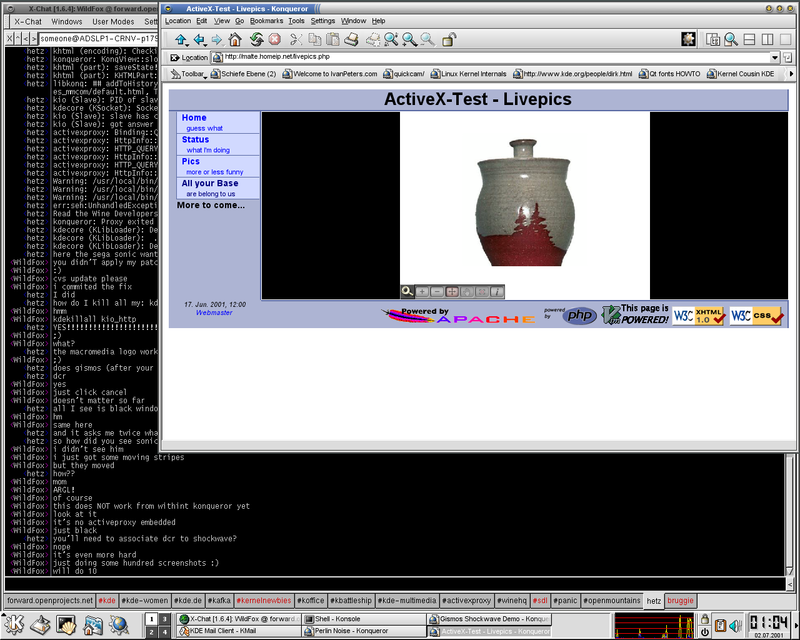 I have SuSE 9.1 and java works fine with Konqueror. I cannot say the same about flash that works when it wants!! I see that: if I open my home page in a tab (my home page contains a flash animation) i cannot see the animation. If I open, in another tab, the home page.. there I can see the animation. After this I can see flash animation until I cose Konqueror. Anyone has a reply for this?? This will really please the x86 users of Linux, however this will still not make ActiveX available on non-x86 architectures. Great job, shame it is (and can) only satisfy a small percentage of users. It would be asking the impossible. Emulation is required between different CPU architectures. Actually.. Wine was (being?) ported to PowerPC. Well, one of the reasons you need an emulator to run Amiga apps on your x86 box is because there is no Amiga API implimented for your operating system on the x86 box. If you have an implimentation of the API, you can emulate a CPU and run applications without having to have a complete VM. It would actually be possible to run Windows applications on PowerPC via any platform Wine supports.. without having a complete VM. If I remember correctly the PowerPC evolved from the IBM POWER architecture and was also developed by Motorolla, it could very well be that the 68000 op-codes form a subset of the PPC op-codes. This is certainly true for the POWER/POWERPC machines, which allows AIX to run on different architectures (this is not QUITE true, as AIX enquires as to the platform its running on and uses architecture optimised routines in the kernel, using a branch table). But the op-codes that can be used by the IBM RS/6000 compiler used for user space programs has to ensure that it will run on both. So this sort of thing is not new. The x86->PPC conversion is totally different. No powerpc and 68k are completely different. 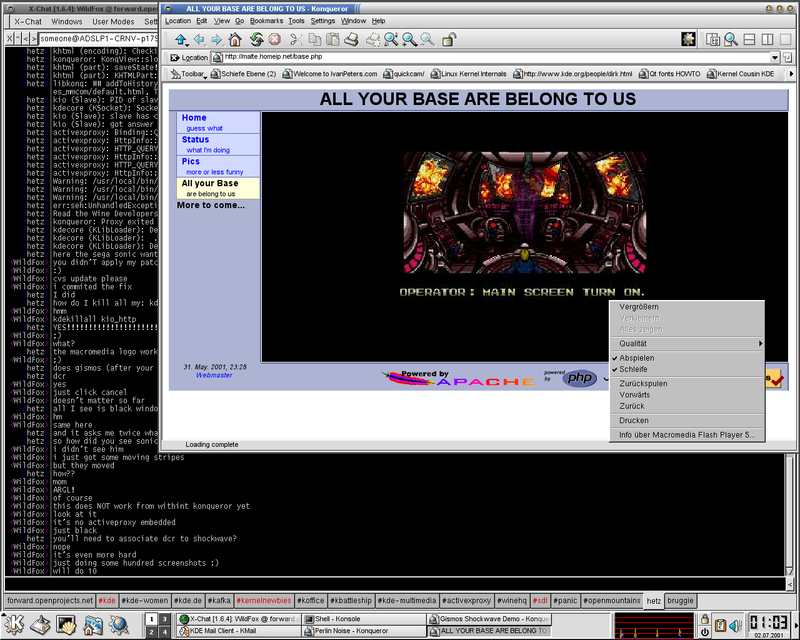 The only way to run programs from one on the other is through emulation. Thank-you a ton Nikolas and Malte! This is really an exciting and and amazing accomplishment! Now I just have to try reaktivate. BTW, does anyone know if perhaps this will be integrated into the main CVS for KDE 2.3? Followers, not leaders. Arguments for this are now people with Linux can do Linux and winblowz, and it costs less when users switch etc.... However, to beat your enemies, one shouldn't marry their daughter/son or marry into their family and hope to inherit your way to success. Therefore, do you think that people will stop using the supported activex junk? Or, they'll keep using it more and allowing micros~1 to set the standards? Looks like you are to follow micros~1 in standards, just like everyone else, not set them. Why is it that micros~1 are able to charge for trash, while you can't even get enough users by giving away your work? Call me a troll or what you wish, but you entitle my opinion, regardless. what's next, to port the BSOD and GPF's ? If you find any exploits, let me know too please. Does Konq have the ability to pre-cache links on the page that you are visiting so that if you click on one of the links, that site has been giving some time to load already and you wait less. It's fairly interesting. When something is done in sparetime and absolutely free others aren't allowed to critizise the work. Those who dare are said to be flamers and co. This is amusing. Where is the freedom you talk about all the time?! >When something is done in sparetime and absolutely free others aren't allowed to critizise the work. On the contrary, constructive criticism is welcomed. People who criticize a project based on unfounded assumptions and poorly-thought-out arguments get what they deserve. And trolls are just dumb. The people who are criticizing this work just for existing (example: what next, port the BSOD?) are being trolls. You don't have to use this, it probably won't even be included in KDE proper because of its dependence on WINE. Besides, they *are* being allowed to criticize. No one is censoring them, and their views are being heard. The fact that they are being called trolls and flamers doesn't inhibit their freedom of speech. 1.) Does the criticism help? 2.) Is it really logical or is it a very narrow view point? 3.) Are the posters mean or insulting to those who worked hard on this project? Now I might note that on one post who shall go nameless's posts last night he took a narrow view saying that if it didn't work everywhere, and just how *HE* wanted it, it shouldn't be on the dot. Thus he received flames. The other poster, who notme mentioned to you said something about porting BSOD's next. Any logical person knows that the developers didn't port ActiveX merely to open up problems, and so this was obviously insulting. When someone works in their freetime to do something like this, they certainly don't deserve, mindless, narrow minded, or down right insulting posts, don't you agree? Program Shockwave plugin from scratch? Which are the limitations which make that programmers didn't make linux-native shockwave plugin yet? Re: Program Shockwave plugin from scratch? This is good. Most of the security holes in activeX aren't applicable for linux anyway plus it's a PATCH. No one is forcing you to apply it! If you don't like activeX don't use it. Don't yell at the KDE League about progress. this isn't going to do the impossible, it's just a nifty hack. Don't whine about being insulted, wine NEVER ran on non x86 archs. Jeeze.. some people.. can't appreciate anything. Just because you don't like activeX doesn't mean everyone else doesn't. I'm a newbye on linux and i'm trying to install reAktivate, I can't undestand why Macromedia doesn't make a Shockwave player for linux, but that's not the problem, the problem is, how can i compile reAktivate? You will be probably laughting a lot now, but i think the documentation(if you call this documentation) of how to install reAktivate is horrible. I installed wine with the patch, but now i don't know how to compile the reAktivate source, can anyone help me please? I don't know if reAktivate works fine, but I think that the documentation have to be improved a lot, because not all the users that use linux are gurus. i dont even get how to get it from cvs. they could write a commandline, but no.. "get it from cvs". =( And how/where do you do that from? I am a total newbie to this. Lame-mans terms and links would be MUCH appreciated. is it dead, or is there a new project with the same goal?